Today was the first day of Casting class at Rio Grande‘s Winter Workshop, being taught by Phillip Scott (who taught Intermediate Stone Setting when I was here last year) and Gregg Burgard. Phil’s link only takes you to his Rio Grande bio page, because Google didn’t want to yield up any other results for the most part, but he is still a great teacher and full of fun stories he shares with the class along the way. He also helped me out the other day when I made an inquiry about a stone setting I’m doing on a ring for a friend of mine, and even though I was worried I’d screwed it all up I was relieved to find out that I was on the right track with what I was doing – I’d just let my own timidness get the better of me once again. Note to self: trust yourself already! 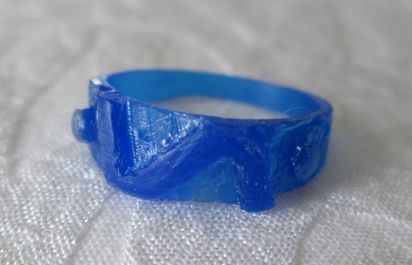 Gregg Burgard DID have a website for me to link to, and I had the opportunity to chat with him quite a bit today – he even pulled out one of the rings he has up on that website (which he designed and patented) and let me see it up close. Both of them are great guys and full of knowledge and helpful tips to share. In addition, we have Chris “Ninja” Nigh assisting in this class – the same great guy who was assisting the Soldering class I took the last two days. The main reason being that it is a Casting class – not a wax-working class. They offer a wax-working class, with Kate Wolf, but I have yet to be able to fit it into the schedule. I did get to watch her do some demonstration today in the lobby though, which was cool. We started off working on the wax a little because it IS a part of casting and they wanted us to get the feel of the wax. So the piece I’ve got in the picture there isn’t finished – there just wasn’t enough time to work it enough to have it cast-ready. We were, instead, given some small wax charm patterns to set up for casting tomorrow. I’ve got two little key charms and a flowery charm in mine, and the investment was hardening around them when I left. Overnight they will have the wax burned out of them and tomorrow we’ll cast the metal and all of that. While I’ve done casting before, I haven’t done it in quite a while and I am not only getting some great reminders, but some information that I didn’t have to work with already. Again – I’m taking copious notes on everything, despite the fact that most of the info in this class has been provided in the handouts we were given too. I find I learn better when I’m taking notes. I’m very excited that tomorrow they will demonstrate mold-making. I’ve been very curious as to how it is done for a long time now. Technically I think I even have a mold of some arrows (and some resulting wax arrows as well) for casting that my mother once had commissioned someone to make her a long while ago. Seeing how to make them and how to inject the wax ought to be very interesting. Okay, another short post tonight as I’m exceptionally tired again. This class, like the Soldering class, has us dead last on the roster for lunch – which means we’re eating late. I think it’s having an odd effect on my blood sugar because I’ve been feeling off the later half of the day. I am looking forward to getting back to some things – my own bed to sleep in, normal meal schedules, and my studio. I can’t wait to start putting all these things I’m learning into practice! This was written by amyhoward. Posted on Thursday, January 31, 2013, at 6:46 pm. Filed under Education. Tagged casting, Gregg Burgard, lost wax casting, Phillip Scott. Bookmark the permalink. Follow comments here with the RSS feed. Both comments and trackbacks are currently closed.